I read all the research. Broken legs over broken necks. I chose to do extended rear facing with our little one before it became the law to keep your itty bittys looking back at the horizon until they turn 2. But when our oldest turned 3, started preschool and became a big brother, we flipped him around. We introduced him to a whole new world of backseat driving. We let his legs freely dangle. And then we were in a car accident. It was a freak accident, and honestly the only one I’ve ever been in. It was loud, and scary and painful. Both kids were in the car, and thank GOD relatively unharmed. The baby was 4 months old, and appears to be aok, but our oldest, who was forward facing ended up with abrasions on his chest from his seat belt buckle and bruises on his hips from the belt as well. Fortunately that was the extent of his injuries, but it shook me up enough to realize that the way our bodies take impact when facing forward is distinctly different from how the force is distributed into a rear facing car seat. So when it was time to shop for new car seats to replace those in the crash, I knew 2 things…1. I wanted the safest ones that exist and 2. our leggy 4-year-old was going backwards yet again and staying that way until it was impossible for him to stay that way. I was fortunate enough to be able to go to the JPMA (Juvenile Product Manufacturers Association) trade show a week after the accident and see all the hottest new products on the market. 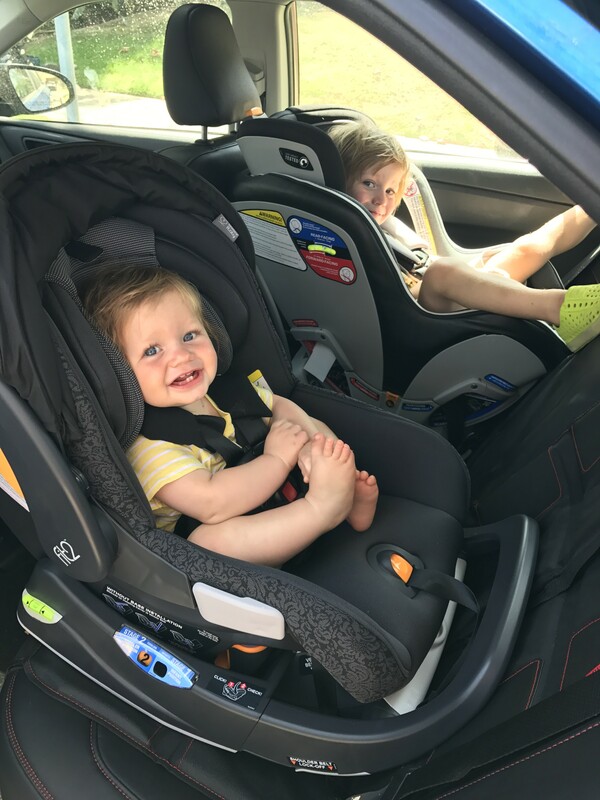 After scoping out all the car seats and talking to the manufacturers about the safety and features as well as doing my own research on crash test ratings I settled on the Chicco Fit2 for Luca and the Chicco NextFit for Avery. I even got a chance to interview Dr. David Hill, MD, FAAP, a pediatrician and spokesperson for the Chicco #turnafter2 campaign. Below are his answers on some common car seat related questions – especially ones related to extended rear facing. How long should my child remain rear-facing, and is it really that much safer? Children riding rear-facing are five times safer in the event of an accident. That statistic alone is staggering and should convince parents to follow the American Academy of Pediatrics (AAP) recommendation to keep children rear-facing until at least age two. Chicco just launched a public awareness campaign on this topic, TurnAfter2, giving parents a simple rule-of-thumb as a reminder. Only turn your child forward-facing when they reach the maximum length or weight requirements of the car seat. Does the recline of the seat make a difference in safety? Yes. Different vehicle models have different seats with varying angles. 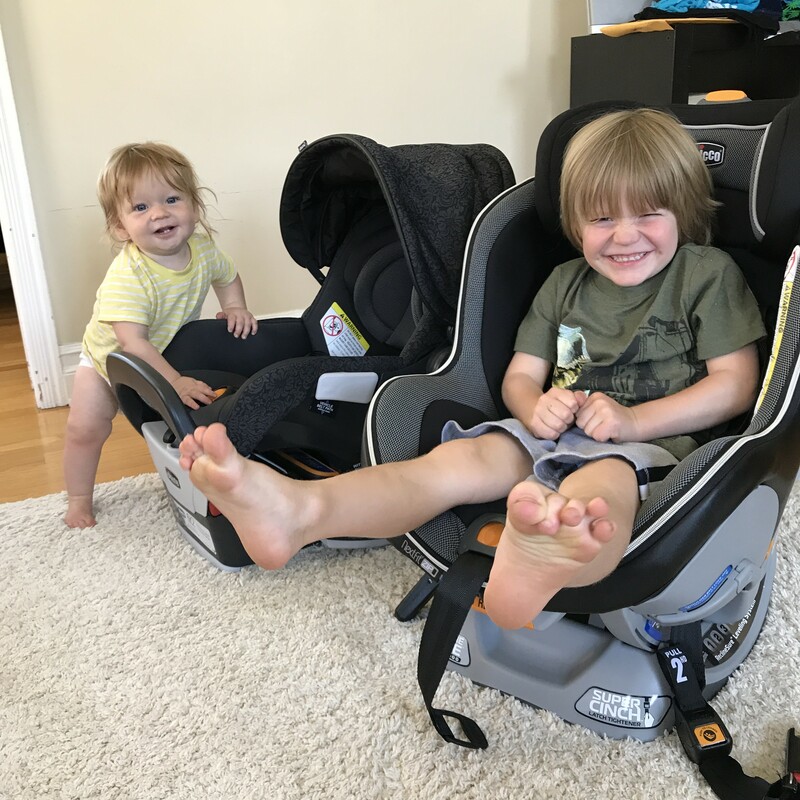 I recommend parents look for car seats that make it easy it easy for them to install correctly every time – and that includes ensuring they are at the proper recline angle. For example, Chicco car seats have bubble level indicators that show when the car seat is installed at the proper angle. This makes it even simpler for parents to understand if their seat is installed properly. My child doesn’t fit rear facing (knees in chest) is it still safe? Won’t they get hurt by not fitting properly if there is a crash? I see so many parents turn their child’s car seat from rear- to forward-facing too soon and there are so many reasons for it! Their legs look cramped, they want to see out the window, they want to see their child’s face, etc. Toddlers are much more flexible than adults, and while their legs may look squished, they’re a lot more comfortable than we would be in the same position. What we’re trying to protect, however, is their heads and necks, not their legs. The reality is that they’re five times safer rear-facing in the event of an accident – and safety should be the priority when it comes to our kids. I was in an accident but my car seat doesn’t appear damaged, do I still need to replace it? The National Highway Traffic Safety Administration (NHTSA) recommends that most car seats need to be replaced if they were in a vehicle that experience a crash — even if the child was not in the car seat during the crash and even if the car set appears to not be damaged. It’s always better to err on the safe side to ensure that you are getting the highest level of safety and performance from your car seat. Where is the safest place for a car seat to be installed? It’s imperative to make sure that you’re always installing your car seat correctly. When properly installed, the car seat should move less than an inch side-to-side or front-to-back relative to the seat belt or the lower anchors. Since the seat can be installed using either the belt of the lower anchors, many parents get confused. If using the lower anchors, it is crucial to make sure that they are in the right place in the back seat. Most vehicles only have lower anchors for the outboard seats (behind the driver and passenger seats), and not in the middle. The vehicle owner’s manual will show where they are located. Many parents use the anchors for the outboard seats with the car safety seat in the middle, and that is just not safe. If using the seat belt, it must be locked to properly attach the car safety seat. My child complains it’s too tight but any looser and I can still pinch it. How tight does the seatbelt need to be? One of the most common car seat errors is having the harness straps too loose. They should be snug over the shoulders, and this means that the parent cannot pick any slack between their fingers over the shoulder and collar-bone. The harness straps should be in the correct slots relative to the child: for the rear-facing position the straps should go in the slots at or below the child’s shoulders, and in the forward-facing position they should insert at or above the shoulders. The chest clip is essential for ensuring the straps stay properly positioned in a crash, and it should be at the level of the armpits. While getting in a car accident with the kiddos was incredibly scary, left me shaken up for weeks and still gives me the occasional panic attack, I know that my kids are both as safe as they can possibly be in their new car seats. The Chicco Fit2 was the perfect choice because at almost 5 months old and 18lbs, buying a new infant seat didn’t make sense since he would grow out of it shortly. But getting a convertible seat that can’t be removed from the car while napping also seemed like a terrible idea. With the Fit2 I can have both. It will fit him until he’s about 2, BUT it can also be removed like an infant car seat. While it’s not as light as an infant seat, the reality is the bigger he gets the less I’m toting it around to and fro, BUT for those times when he falls asleep RIGHT before we get home, I don’t have to wake him up to bring him inside which is worth the extra pounds. As for the NextFit, it has a rear facing limit of 40lbs and goes up to 65lbs forward facing. The cover zips off INSANELY easily to be washed (a priceless feature for messy preschoolers), and installation, adjustment of recline and seat belt fastening couldn’t be easier with their RideRight, LockSure and SuperCinch technology. Honestly they make it nearly impossible to install or use incorrectly. This is so important since sadly poor installation is one of the leading safety issues with car seats. When I rolled up to preschool drop off with Avery rear-facing next to his baby brother I definitely got some questions. My 4-year-old, while only about 32 lbs is quite tall and leggy. I told the other moms about our experience in our car accident and honestly couldn’t care less if I get the odd side eye if it means I know my little one is going to be as safe as possible. Some people lump in extended rear facing with ‘alternative’ parenting choices like breastfeeding into toddler-hood, refusing vaccines, etc. But honestly, it’s about safety. Kids are 75% more likely to be seriously injured forward facing. That’s HUGE! We weren’t in a minor accident, but it by all means wasn’t major and our son who was well beyond the threshold for forward facing was still injured by his car seat because of the impact. I can’t imagine what could have happened had the accident been worse. The fact that he was on the opposite side of the car that was hit and the baby was inches from where it was hit, yet unharmed was enough to convince me that rear facing is inherently safer. Not everyone will choose to rear-face until their kids reach the car seat limits, but I strongly urge you to consider it. And at a minimum #turnafter2 because any sooner is like leaving your kiddo in the bath unattended – sure, they might be ok…but they might not – what percentage of ‘might not’ are you ok with? On Miss Universe, Makeup and Societal Norms: What is Beautiful?